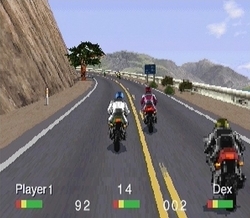 Road Rash is a vehicular combat racing game that was later ported to the PlayStation in 1995. The two modes are Thrash (quick, single races) and Big Game (career mode with five levels of progression). In the latter, you need to place third or higher in all five tracks, while earning enough cash to buy faster bikes. Avoiding being busted by the Police, or wrecking your vehicle is key, but luckily you can fight back with punches, kicks, or even special weapons such as clubs and chains! While there's only five tracks, they're expertly designed and include a mixture of congested city streets, and wide-open highways. They increase in length as you progress through levels, and some even have multiple paths which is a brilliant idea for experimentation and strategy. The racing is a pure adrenaline rush and it's thrilling to be both in-and-out of control at the same time! The sense of speed is fantastic and every time you reach the apex of a hill it's very much a rollercoaster ride where you're not quite sure what's waiting on the other side! While the draw distance isn't quite as good as Road & Track Presents: The Need for Speed (1994, 3DO), you can still clearly see what's ahead even when at top speed. The frame-rate is choppy though, and it does affect the racing somewhat due to the over-steer it creates when turning. Another minor criticism is the overuse of oil slicks and puddles as they're scattered too liberally. There's no faulting the difficulty curve or inspired combat however, and there's nothing quite like punching a fellow rider and watching them crash helplessly into an oncoming vehicle! Presentation-wise, the game is top-notch with cheesy cut-scenes and an awesome licensed soundtrack. Road Rash is a faithful adaptation of the classic 16-bit franchise, and it's impressive just how well it's made the transition to 3D. The developers captured the essence of the Mega Drive trilogy without resorting to unnecessary gimmicks, and the end result is a superbly crafted game with a perfect blend of combat and racing. Random trivia: The licensed soundtrack features bands such as Soundgarden and Swervedriver.